A well point is a perforated pipe about 1m long and 5cm in diameter. The perforations are covered with a screen to prevent clogging. 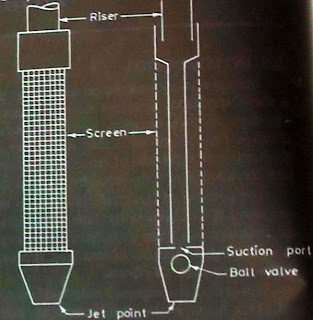 A jetting nozzle is provided at its lower end. A conical steel drive point is fixed to the lower end of the well point to facilitate installation. A ball valve is also provided near the lower end which permits flow of water only in the downward direction during installation. 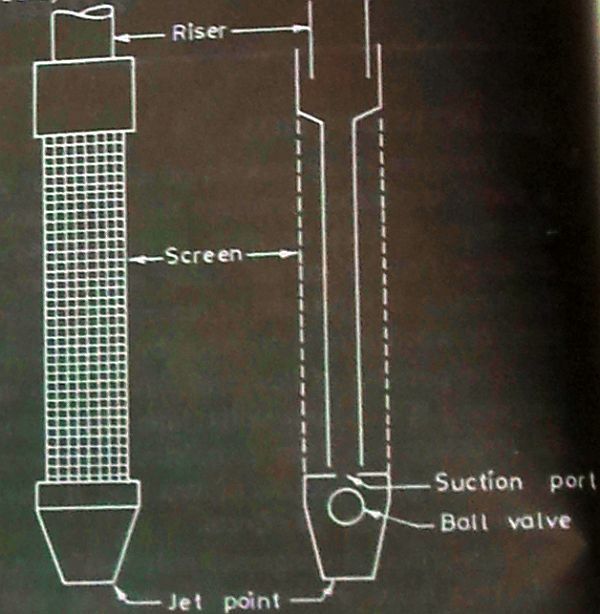 The well point is connected to the bottom of the riser pipe of the same diameter. Risers of different well points are connected to a horizontal pipe of 15 to 30cm diameter, known as header. The header is connected to a specially designed pumping unit. The spacing of the well points depends upon the type of soil and the depth of water. Generally, it varies between 1 to 3m. Well points can be installed in a drilled hole, but generally these are installed by jetting. Water is pumped through the riser pipe in the downward direction. As it discharges through the nozzle, it displaces the soil below the tip. Jetting is continued till the required penetration of the tip is achieved. The advantage of installation by jetting is that the water under pressure washes away soil fines near the tip and leaves a relatively coarse material. It forms a natural filter around the tip. The hole formed near the tip is filled with coarse sand. After the well points have been installed around the area to be dewatered, pumping is started. Each well point lowers the water table around it and forms a small cone of depression and a common drawdown curve is obtained. The water table is thus lowered. Well points are suitable for lowering the water table by 5 to 6m in soils with a coefficient of permeability between 1 x 10-4 to 1 x 10-6m/sec. The screen normally provided with the well points can prevent medium sand and coarse sand from entering the well point. If the stratum to be dewatered consists of finer soils, a sand filter has to be provided around the well point. It is essential to continue pumping once it has been started until the excavation is complete. If it is stopped in between, it may prove to be disastrous. Labels: Civil Engineering, Construction of a well point, Single stage well points, Well points, What is a well point?